Just bring your bright smiles and good spirit. This lovely 5 bedroom, 3 full bath property is ready for your vacation. Hidden Valley Four Season Resort will provide plenty to entertain all or you can just relax and enjoy the breathtaking views. Located in Pennsylvania's beautiful Laurel Mountains, Hidden Valley offers all the best activities a mountain resort can offer including downhill/Crosscountry Skiing, Snowboarding, Snowmobiling, Sledding/Tubing, Hiking, Fishing, Golf, Tennis, Basketball, Racquetball, Fitness Center/Gym, Health & Beauty Spa, Sightseeing/Wildlife Viewing, Rock Climbing, Spelunking, Hunting, Horseback Riding, Rafting, Swimming, Biking, Mountain Biking, Kayaking, Miniature Golf, Amusement Park, Zoo/Wildlife Park, Shopping/Antiquing, Dining, Live Theater, Movie Theater, Museums, Hot Air Ballooning and more. We provide all bedding and towels. My large family has enjoyed this resort property for many years and have never rented it before. We hope other families can now create their own great memories in our 5 bedroom, 3 bath townhouse. The Hidden Valley Resort is SAFE and has all the amenities that that make a great family vacation. Our family rented for the week after Christmas and the month of January. There were a few small issues in the beginning but Kathleen was very quick to respond and took care of everything. She really wants you to enjoy her home and we did! The two basement bedrooms were perfect for the grandkids especially with their own tv and full bathroom down there. 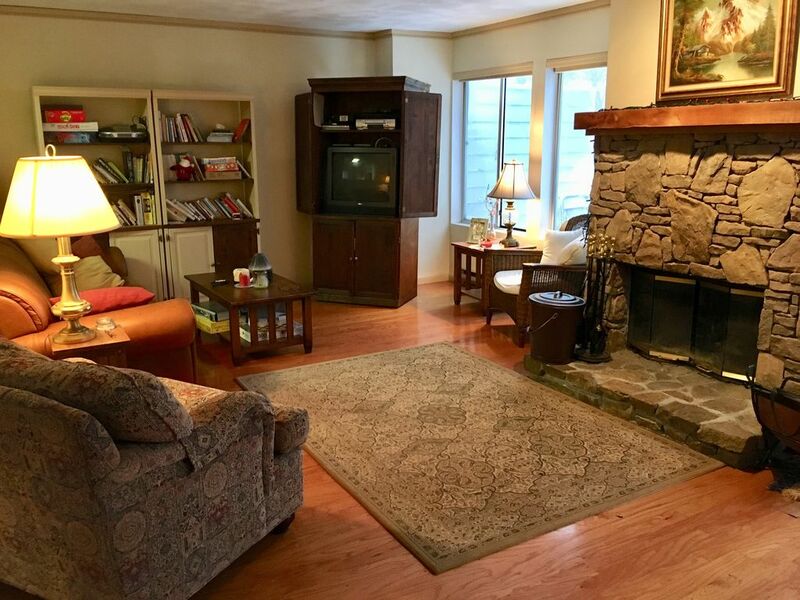 The main floor is spacious with ample space in the kitchen and plenty of room to enjoy family dinners and games at the tables in dining room and family room. We were all sad to leave and are looking forward to going back next year! We enjoyed the stay at the condo. It was clean, but there were a few items that need to be addressed. The basement is very musty and needs a dehumidifier to make staying there much better. We had the same problem at our house and the dehumidifier was the answer. Otherwise we enjoyed the stay. Thank you for the review. I care very much about the experience each guest has. I wish you would have mentioned wanting a dehumidifier during your stay because I have one and would have set that up for you. Wishing you all the best in future travels. Large family in town for family wedding. We loved this home. Perfect and comfortable for all of us, parents, kids & grandchildren to stay while we were in town for a family wedding. The setting is beautiful. Would love to return during the winter snows and enjoy the skiing right down the road. Thank you for taking the time and giving me such a nice review. Also thank you for being such a nice house guest and leaving the house so tidy. I sure hope you will visit again. Kathleen’s vacation house was ideal for our big family. Everyone was comfortable and enjoyed it! The lovely house has just enough space for families with children. It’s well-designed and we’ll-supplied. Some fans in the bedrooms would be helpful in the summers. A very nice, comfortable space for extended family to meet and stay. Everything is included for a reasonable price, with plenty of room and first class furnishings. Great place to gather with family! We went there to visit with relatives and had them come to the Home so we can all be together in one place. Great home, beautiful location. Thank you! I am very happy that you had a good time with relatives. Thank you for the positive review and for leaving the property in such clean condition. This property in not ski in / ski out but my family walks to the top of the slopes. There is a shuttle at the corner too. Eagles Ridge views overlook Forbes State Forest and is located within walking distance of the swimming pools, tennis courts and basketball courts.